How many seats does Bovard hold? Orchestra Level – 12 wheelchair spaces along with companion seats. First Balcony – 2 wheelchair spaces along with companion seats. These seats are not included in the seat count below and will only be released 10 minutes prior to show time. The default seating configuration is Full House Seating. Please visit our seating page for more information. Does my rental of Bovard include my staffing? What about additional staff? No. Your rental and staffing rates are separate. Please see the Bovard rental and staffing rates. In some cases, additional Bovard staff are brought on for events for training. In these instances, they are not billed to the client. For these events, the additional staff are for on-the-job training purposes only. We are a department where our student workers are learning skills specific to their growth and development with TES. Our goal is to adequately staff all events based on the event details. We are confident that these staffing levels help to ensure that each event runs safely and seamlessly. In the case where we have additional staff for on the job training, please know that we are providing guidance and expertise for our next stage manager, audio and/or lighting technician. If you have additional questions, please let any Bovard Production Manager or Supervisor know. Will the rates differ between a rehearsal and a performance? Yes and No. Your venue rental fee is the same for your rehearsal and day-of performance. Your staffing fees, however, will differ by the number of hours reserved and are evaluated on a case by case basis by Bovard Auditorium’s Production Office. I am having a fundraiser. Will Bovard reduce my rates? Bovard Auditorium is a revenue centered theater that relies on income. Therefore, we cannot reduce your rates. Do I need to have staffing during my rehearsal? Yes. Bovard Stage Crew is required for any use of the building. There is no time the building can be used without Bovard Crew present. May I provide my own ushers for my event? No. Bovard Auditorium Ushers are required for your event. Does my rental of the facility include use of the audio system? Your rental of the facility does include use of the House Audio System, if an audio technician was scheduled for your event. Please refer to our audio information page for details. Does my rental of the facility include use of the entire house lighting system? You may use the entire house light plot. Please see the detailed outline on our lighting information page to view the house plot. Any modification to the house plot will require additional rental time and a lighting technician to be determined by the Bovard Production Manager. Does Bovard have follow spots? Bovard has no follow spots. You will need to rent from an outside vendor and arrange a delivery time with the Bovard Production Office (213) 740-4211. Does Bovard have moving lights? Bovard maintains Mac 550’s and Mac 700’s in a moving light package, which is included in your rental. Visit our lighting information page for details about the capabilities of these fixtures. Does Bovard have video or slide projecters? Bovard has a Panasonic PT-DW10000U video projector included in your rental. We require a three working day notice regarding your intention to use it. Rear projectors need a throw of 14 to 20 feet. 250V circuits are not available for rear projection. Does Bovard have shower or laundry facilities? I’d like to serve food during my performance. Is this possible? Food and Beverages shall only be served by arrangement with an on-campus food service provider. No outside food or beverages may be sold. No food or drink is permitted in Bovard Auditorium. Can I sell items during my event? Bovard allows two vendors per event. A $200.00 flat fee is charged to the vendor/client for each vendor. No vendors are allowed without express permission of both the University and the client. May I smoke inside or outside of Bovard Auditorium? No. Smoking is strictly prohibited in Bovard Auditorium. USC is a Smoke-Free Campus. The university is committed to promoting a healthy, safe and comfortable environment for all students, faculty, staff and visitors. Smoking is prohibited in all indoor and outdoor facilities. Does Bovard have air-conditioning or heating? Yes. 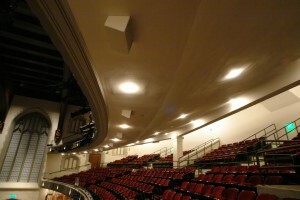 Bovard Auditorium has air-conditioning and heating. How many dressing rooms does Bovard have? Please see the stage diagrams for exact locations. What are the stage dimensions inside Bovard? The dimensions of the stage depend on configuration. You may find more detail on the stage diagrams index. Will Bovard provide tables and chairs for my event? Bovard Auditorium has 4 tables and 10 chairs for your event. You may rent EXTRA tables and chairs from Facilities Management Services (FMS) on campus 213-740-6833 or you may rent off-campus as long as you arrange for delivery with the Bovard Auditorium Production Office. Does my rental include security? Security is not provided by Bovard Auditorium. It is provided and may be required by the Department of Public Safety (Lt. Mark Cervenak). You must contact the USC Department of Public Safety at least two weeks prior to the event. DPS will then determine whether or not security is needed for the event. Personnel will be assigned as determined by USC Public Safety and any security measures will be communicated directly with you. Does my rental include Parking? Your rental of the facility does not include parking. You may inquire about parking with the Department of Transportation Services at (213) 740-3575. May I bring in outside rental equipment and use it along side Bovard’s equipment? You may bring extra equipment with the approval of the Technical Director or Production Manager for Bovard Auditorium. May I repaint the stage? No, you may not repaint the stage. May I staple or tape things to the wall? No, you may not staple or tape any items to the walls of the auditorium. If you do, you will lose your cleaning and damage deposit. May I remove seats from the auditorium? Removal of seats also requires approval of the Technical Director or the Production Manager and is evaluated on a case-by-case basis. Does Bovard have a communications system? Bovard has a Clear-Com system for use free of charge with positions in the control booth, backstage and second balcony as well as a limited number of wireless units. How many fly lines does Bovard have? Fourteen. Three of these are dedicated electrics. Please see the rigging diagram for details. What is the throw from the follow spot positions on the second balcony to the stage? To the proscenium: 98 feet. To the lip of the stage: 80 feet. Does Bovard have extra stage power? Bovard has a 400 amp three phase circuit on stage right. A qualified University electrician is required to tie into it. Please see our power details. When am I required to pay my bill? There are several different billing and information deadlines. Please see our reservation policies for more information. Do I have to pay for cleaning of the facility after my event? You are required to leave a minimum $1,000.00 cleaning deposit on a separate check or credit card. You are responsible for leaving the building in the same condition as when you entered. If you fail to clean the facility adequately, then you will forfeit your cleaning deposit. Bovard Staff will have mops, brooms and trash bags on hand to assist with your clean-up.